Patellar tendonitis is a common source of pain in athletes of jumping sports, such as basketball and volleyball. It is an inflammation of the patella tendon, which is the tendon that extends from the bottom of the patella (kneecap) to the top of the tibia. It can be very painful to athletes who need explosive strength with jumping and pushing off, and therefore it can significantly limit an athlete’s ability to play at a high level. Most of the time this is an injury that develops over time. An athlete will usually not remember a specific event that initiated the symptoms. Most of the time pain from patella tendonitis only affects sports activities, and usually there is no pain at rest. More significant or lengthy bouts of the pain, though, can affect activities of daily living. 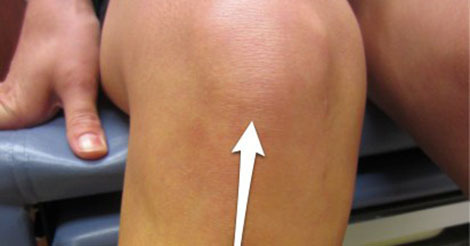 Typically the athlete will notice pain at the top of the patella tendon where it attaches to the bottom of the patella. Physical examination by a sports medicine physician is usually sufficient to make the diagnosis. X-rays are almost always normal. Occasionally the physician will order an MRI to determine if there is an area of tendinosis, or small area of degeneration within the tendon. Treatment is almost always nonsurgical. Short-term rest from the offending activity can be helpful, although this is difficult in high-level athletes during the season in which they play. Ice to the specific area of pain has been shown to be helpful, and I recommend athletes use ice not only after activity but also several other times throughout the day. Physical therapy for stretching and strengthening exercises for the entire lower extremity can be helpful, and often a physical therapist will include modalities such as ultrasound to try to help the pain. Sometimes taping or wearing a patella tendon strap can be helpful. Recently platelet-rich plasma injections into the area of tendinitis has been attempted, although there is no long-term data as of yet to show if this new treatment will be successful. Surgery is almost never recommended, as excising a portion of the patella tendon can be very debilitating to an athlete, and this procedure is not always successful.